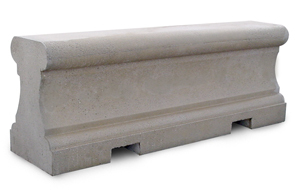 These steel-rebar-reinforced concrete barriers work great as stand-alone units. Smart design allows for end-to-end placement, ideal for providing perimeter security, such as a continuous security wall, roadblock or traffic barrier. Concrete construction makes these concrete security barriers resistant to corrosion as well as vandalism. Featuring steel rebar-reinforcing and forklift knockouts for ease of relocating. Available in the color options as shown.